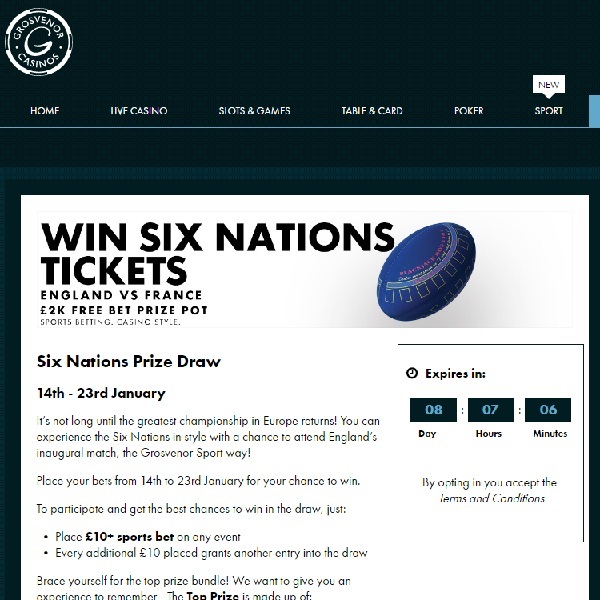 Rugby fans need to head over to Grosvenor Casino as soon as possible as this week they are giving away tickets to the Six Nations. To be in with a chance of winning tickets to England’s inaugural match you need to head over to the casino and place a bet of at least £10 on any sports event. Each £10 you bet will earn you an entrance to the draw and there is no limit on how many you can earn. You have until 23rd January to earn as many entries as possible. The top prize winner will receive a £200 free bet token, 2 hospitality tickets for the England vs France match, a meal before the match and 1 night in a hotel. There are also 100 free bets to be won from the £2,000 pot so even if you don’t win the top prize there’s a chance you won’t leave empty handed.